Citation Information: J Clin Invest. 2018;128(3):1106-1124. https://doi.org/10.1172/JCI93025. Intake of hemoglobin by the hemoglobin-haptoglobin receptor CD163 leads to a distinct alternative non–foam cell antiinflammatory macrophage phenotype that was previously considered atheroprotective. Here, we reveal an unexpected but important pathogenic role for these macrophages in atherosclerosis. Using human atherosclerotic samples, cultured cells, and a mouse model of advanced atherosclerosis, we investigated the role of intraplaque hemorrhage on macrophage function with respect to angiogenesis, vascular permeability, inflammation, and plaque progression. 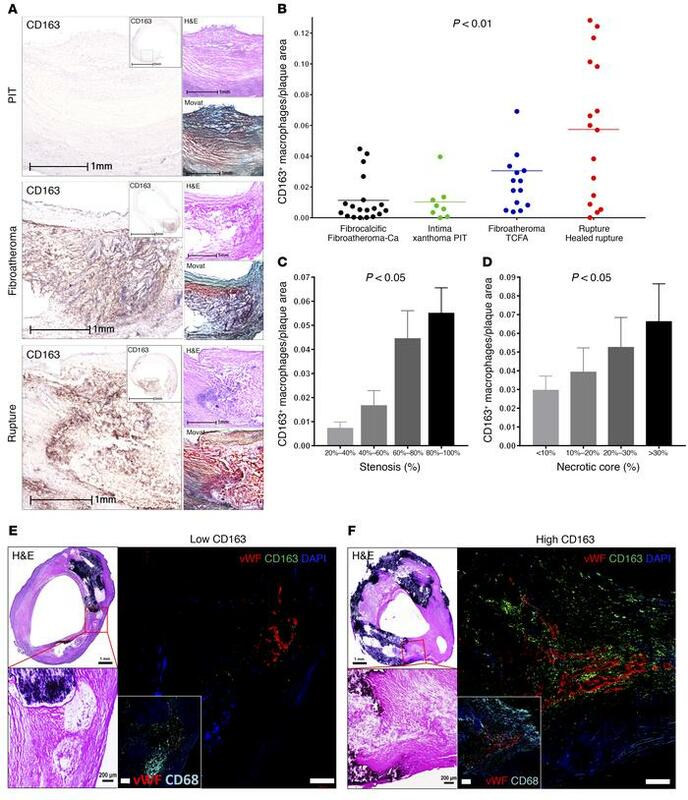 In human atherosclerotic lesions, CD163+ macrophages were associated with plaque progression, microvascularity, and a high level of HIF1α and VEGF-A expression. We observed irregular vascular endothelial cadherin in intraplaque microvessels surrounded by CD163+ macrophages. Within these cells, activation of HIF1α via inhibition of prolyl hydroxylases promoted VEGF-mediated increases in intraplaque angiogenesis, vascular permeability, and inflammatory cell recruitment. CD163+ macrophages increased intraplaque endothelial VCAM expression and plaque inflammation. Subjects with homozygous minor alleles of the SNP rs7136716 had elevated microvessel density, increased expression of CD163 in ruptured coronary plaques, and a higher risk of myocardial infarction and coronary heart disease in population cohorts. Thus, our findings highlight a nonlipid-driven mechanism by which alternative macrophages promote plaque angiogenesis, leakiness, inflammation, and progression via the CD163/HIF1α/VEGF-A pathway. CD163+ macrophages are associated with progression of carotid atherosclerosis in humans. (A) Representative images of human carotid arteries with PIT, fibroatheromatous, and ruptured atherosclerotic plaques. High-magnification IHC images of CD163 with low-magnification insets. H&E and Movat pentachrome stains are also shown. Scale bars: 1 mm and 5 mm (insets). (B–D) Correlation between CD163+ macrophages and human carotid plaque progression. (B) Human carotid plaques were classified as fibrocalcific or fibroatheroma with calcification (Fibroatheroma-Ca) (n = 19, black); intima xanthoma or PIT (n = 8, green); fibroatheroma or TCFA (n = 14, blue); and ruptured or healed rupture (n = 16, red), with the corresponding percentage of CD163+ macrophages per plaque area. (C) Correlation between CD163+ macrophages and the percentage of stenosis. The percentage of stenosis was categorized as follows: 20%–40% (n = 5); 40%–60% (n = 14); 60%–80% (n = 23); and 80%–100% (n = 28). (D) Correlation between CD163+ macrophages and the percentage of necrotic core area. The percentage of necrotic core area was classified as: <10% (n = 32); 10%–20% (n = 19); 20%–30% (n = 9); and >30% (n = 10). (E and F) Human plaques from CEAs were examined by histology and immunofluorescence. Images were acquired by confocal microscopy using a ×20 objective (9 tiles, E and F), with optical slicing in the z axis. In E, as explained in the text, areas from fibroatheromatous lesions containing foam cell (CD163– [green], CD68+ [cyan]) macrophages (i.e., low CD163) and M(Hb) macrophages (CD163+, CD68+ [i.e., high CD163]) were immunostained using antibodies against vWF antigen for detection of microvessels. Nuclei were counterstained using DAPI (blue). Note that calcification is seen as dense areas of dark purple. Adjacent low- and high-magnification images of H&E-stained sections show the corresponding regions of angiogenesis. Scale bars: 1 mm and 200 μm. Results are presented as the mean or the mean ± SEM. For multiple group comparisons, 1-way ANOVA was used. P values shown in B–D were determined by 1-way ANOVA.